I’m sure many of you thought of the songs just by seeing these figures!! And both are now scheduled for rerelease!! The rerelease polls were created as a part of GSC’s 10th anniversary… it’s hard to think that in May we’ve already reached the end of our 11th year! But even so, the rerelease poll results are still being used to help us decide what needs to be rereleased, and I’m sure that will still continue for some time to come! This image comes from Hamako’s desk (one of 2012′s newcomers), look at all the sticky notes! One is a very simple “The mail size limit is 1MB”, but I can’t help but wonder why one of them reads ‘Servant’! Kagamine Rin & Kagamine Len! From the Character Vocal Series comes two 1/8 scale PVC figures of the twin Vocaloids, Kagamine Rin and Len! 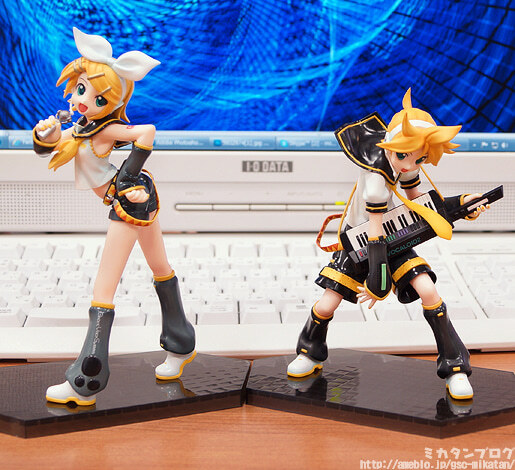 Sculpted by the popular sculptor Kanji Toona, these energetic figures of Rin & Len are sculpted as if they’re both performing on stage for fans. But this time I’m going to ensure I get the photos that I want!! Both Rin & Len are absolutely amazing! Even after three years they look incredible! Their individual sculpting alone is great, but the way that Otanaka from the planning team through to create the duo pose between the two of them looks even more fantastic! There is a little extra trick to the double pose which I’ll show a little later. Let’s take a look at Rin-chan first! She is in a lovely pose with one hand on her hip as she turns her body to the side!! It’s gorgeous!! The pose and expression capture Rin’s playful personality, and the little gaps of bare skin also provide a slightly sexier side to her as well! This is really where Rin-chan shines!! It wouldn’t be easy to see this hipline through a skirt, but with hot-pants you really get a good look!! 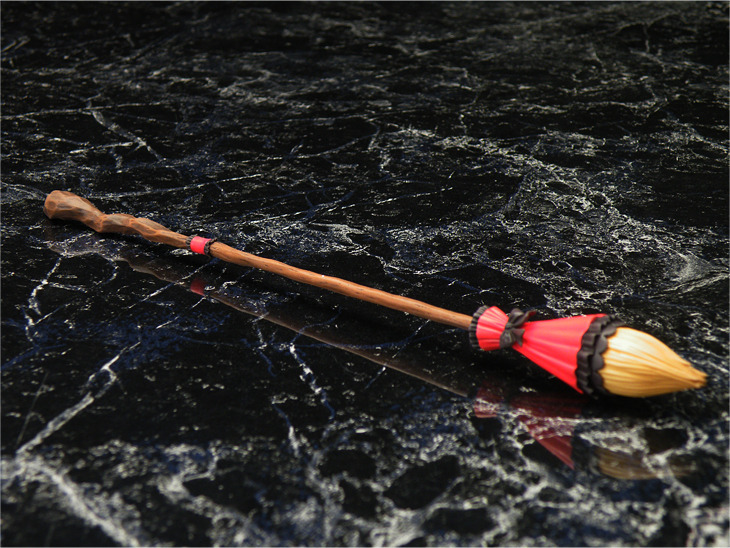 It’s not only a lovely size, it also has such a nice round shape… it’s perfect!! Her curved body and soft looking stomach! The way her body is twisted around not only shows off her bottom, but also allows for the little glimpses of skin between her clothes as she turns! Just look how smooth and soft her stomach looks!! Next up we have Len-kun! While Rin is lovely cute pose, Len instead has a flashy, cool looking pose! He has a lovely youthful looking body, emphasized by the great sculpt work! Even the back has a dynamic feel to it! His outfit and suspenders are both sculpted in mid-motion to capture the movements he is making during his performance! Such intricate detail on the keyboard! Even as a 1/8th scale figure, the indented areas around the black keys are carefully sculpted on! I also personally love the way his knee looks as well as thighs you can make out through his loose pants! A special way to display them! 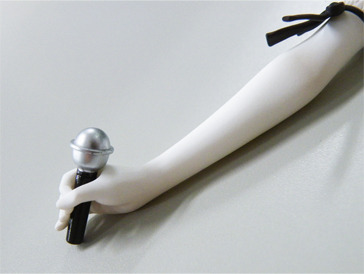 Most figures have both their feet connect onto a single base, but Rin and Len both only connect using a single foot. 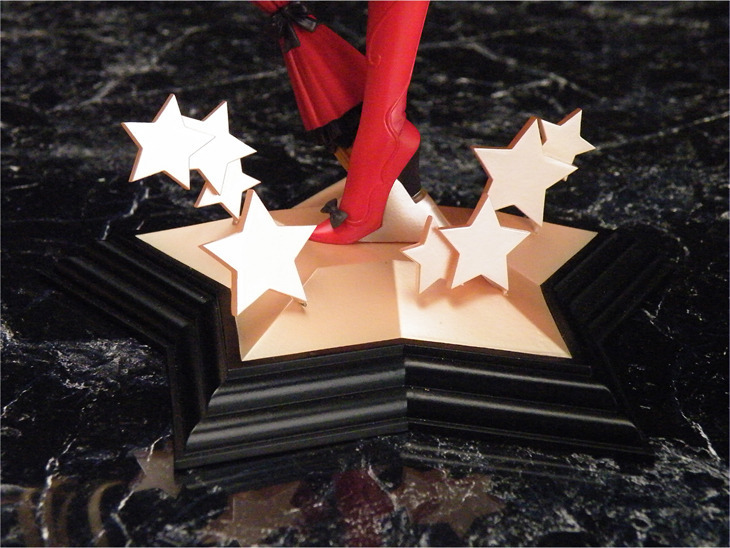 This means you can spin the figure around with that one foot as an axis, which easily allows you to create a pose between the two of them like this – you could even have them facing each other, or back-to-back instead! There are a load of different positions to try! These stands were actually made using 3D data, but they were definitely not the first use of 3D sculpting by GSC. The very first was actually back with Nendoroid Bicycling Rider (Nendoroid #21) – her bicycle was made using 3D data! 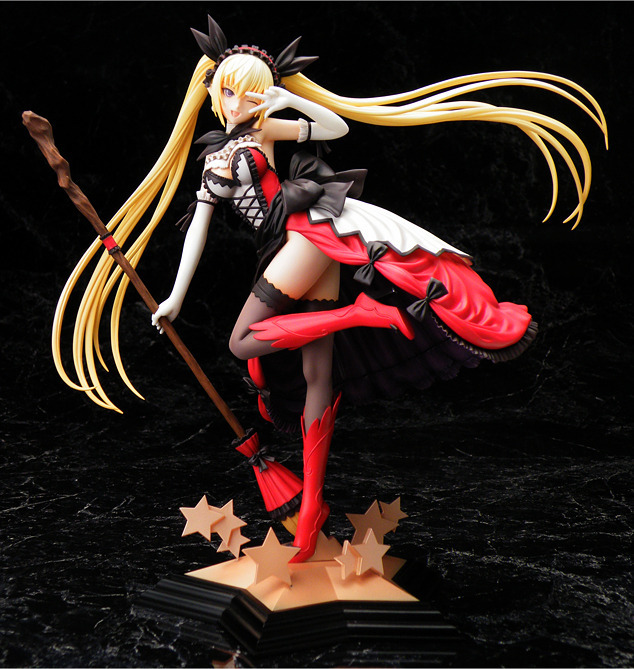 The figure is scheduled for July 2013 release with no price yet.